Knowing your target audience is the key for everyone who wants to be successful in the business. 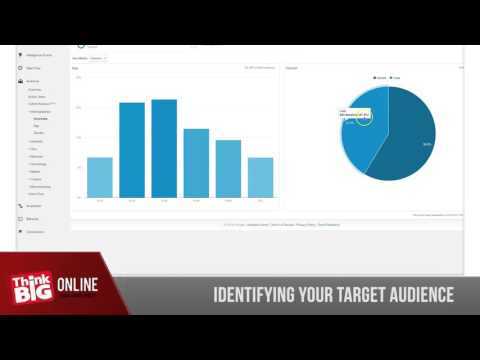 In this video, you will learn how to use your Google Analytics data and identify your target audience. In order to advertise on AdWords you will need to create a Google Account. 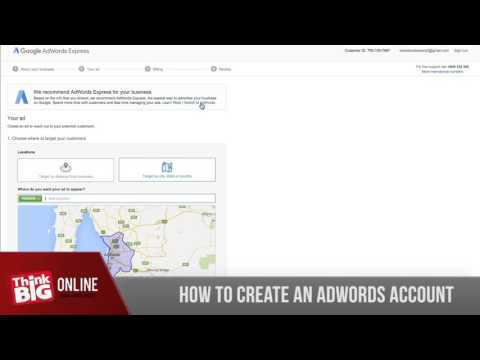 Here is a quick tutorial on how to create a Google AdWords account. Are you running an e-commerce website? And would like to track and reconnect to your audience by showing significant ads across their different devices. Bring back previous visitors and improve your conversion rates with Remarketing. 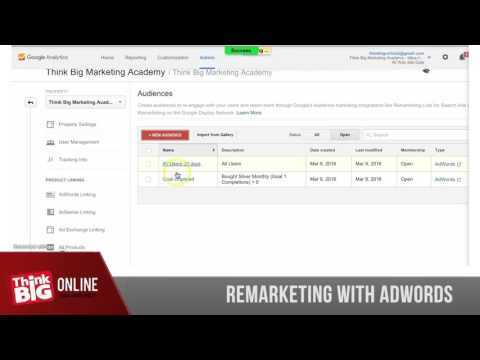 In this video, we will show you how to create and manage Remarketing audiences in Google Analytics. And how to use them in your advertising account to create a Remarketing campaign. You may also like: What is Facebook Remarketing? The reason why this is important is that by looking at what your competitors are doing, you don’t have to reinvent the wheel. There’s no point in starting out campaigns as a test and having them potentially fail when you can have a look at what your competitors are doing and decide for yourself if you would like to invest money into that channel or not. Fortunately, there are several tools to help you uncover your competitor’s online marketing activity. 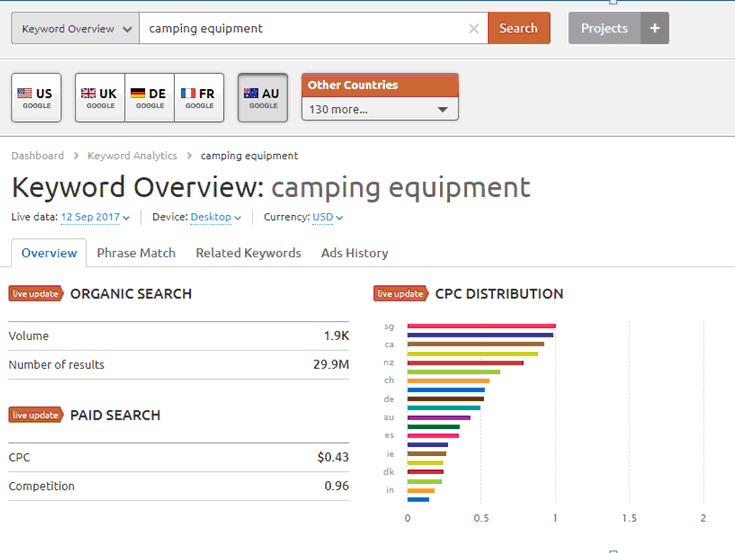 One of the tools we use is SEMrush, and in this blog post, I’ll show you how to use it to get valuable information about your competitors. This will allow you to counter their strategy and outsmart them when advertising online. I have used Tentworld as an example in this blog post. You will instantly get an overview of how the company is doing and the estimate of how much traffic the website is getting from Google. You will be able to see both, the organic listings and the paid listings. In the figure below, you can see Tentworld's organic traffic has dipped slightly, but remains the main source of website visitors. Over the six-month period, they have been investing in SEO quite significantly, while their Google Adwords spend has been flat. If you look at their data over a two-year period, you can observe their trending data. They have started a campaign around October 2015, which has helped them get a significant amount of traffic. In fact, they have almost doubled their traffic from January 2016 to January 2017, as you can see from the figure below. We’ll now delve a little deeper, and for this, I am using my paid subscription. With a paid account of SEMrush, you can get a lot more competitive insight which is otherwise very difficult to find. 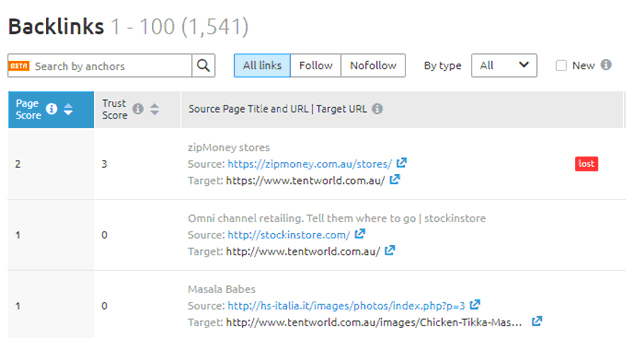 For instance, you can see Tentworld is in position 1 for the keyword, “swag”, and “tentworld.” They are potentially getting a significant volume of traffic from ranking in these positions. You can also get a list of some other competitors that you may not know are advertising on Google. Drill down, and you will find the Top Paid Keywords. So now you can see the exact keywords your competitors are using and what they are paying Google for, which means you’re no longer guessing. If you’re running an Adwords campaign, you get to learn a lot about the keywords your competitors are bidding on, especially if they are bidding on the keyword for a long time. Take for example the keyword, “camping equipment.” You can get in-depth information as can be seen in the image below and also download PDF reports which will come in handy. You also get all different variations of that keyword and related keywords. 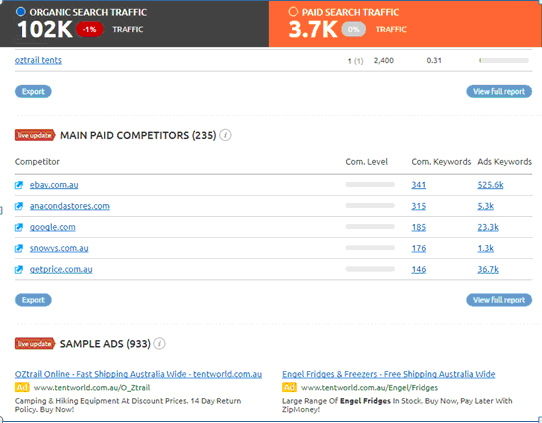 Next, you can identify who is ranking for each particular keyword and you can also see what ads competitors have been running. If competitors have been running certain ads for a long time, then you know the ads are probably working. Either that or they don’t know what they are doing and are running non-performing ads all the time. So you can use this to give yourself a head start in creating a campaign. When you are doing SEO, you want to find out where their backlinks are coming from because they help you rank higher in Google and Bing. You can click on the link to see where it is coming from and based on the page score, you know whether or not it is a powerful link. This is another opportunity to figure out what your competition is doing. PLA Research is a sneaky way of finding out what your competitors are doing online. You can see from the diagram below the ads they are running and their position in paid search. So, as you can see it’s an intelligent way to find out what others are advertising for and what’s actually working without having to invest time and money into expensive market research or stocking products. With this information, you can decide on what to stock, and how you are going to advertise it. Next, you can identify what type of advertising they have been doing. For instance, you can do a search to see if they have been doing any video advertising. In this case, it does not appear that they are doing video advertising. Similarly, you can check if they have been doing display advertising. Another great feature of SEMrush is that you can monitor your competitors to see if they improve in rankings over time. You can also do this for your own domain. You can choose a couple of different competitors from this market and see who has the biggest market share. You can select organic, paid or PLA. 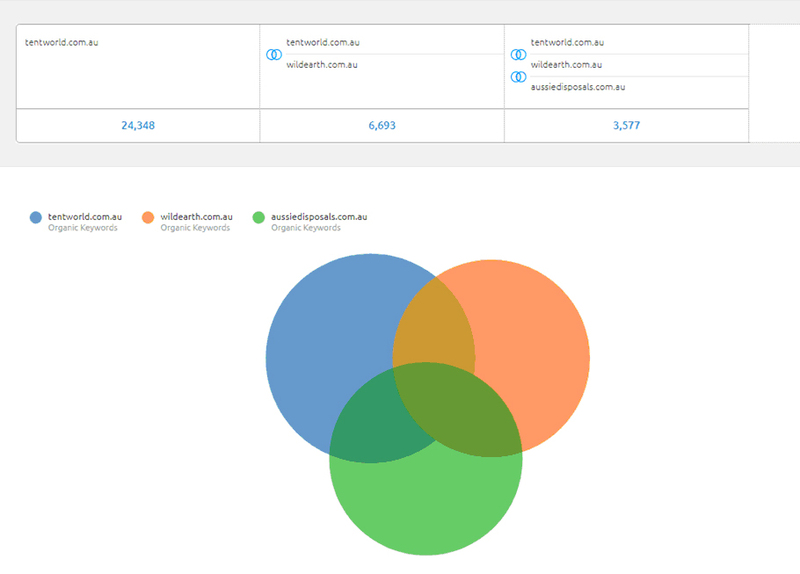 The “charts” functionality in SEMrush provides a visual representation of who has the biggest market share. In this example, it’s clear that Tentworld is only slightly larger than Wildearth. So you would research Wildearth, to see what they are doing, exactly how they are doing it and how you can leverage off that information. 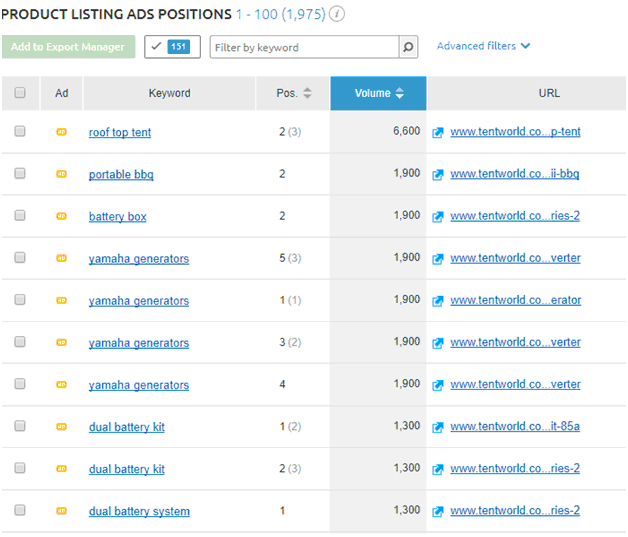 You can also see whether they are using Google Adwords, and what is converting for them. This is just some of the information you can get from SEMrush. Tools such as this one should comprise an important part of your online marketing arsenal to eliminate the guesswork involved in competitor research. What’s also important is to know how to use these tools to your advantage. Putting an eager 12-year-old behind the wheel of a Ferrari can prove to be a costly mistake. In the same way, software subscriptions can drain a company’s resources if they are not put to good use or used incorrectly. A better option is to rely on trained professionals experienced in using the software to help you with your competitor research and design a strategy which can help you gain an advantage in your market. If you would like help in analysing your market, identify lucrative opportunities which your competitors are ignoring, contact Think Big Online, and together we’ll find out the shortest path to your online success. In our previous blog post, “How Video Marketing Helps Create Authority Positioning by Attracting Attention, Engaging Audiences and Building Trust”, we explained the importance of video marketing in creating an authority position. That being said, there are 60 hours of video being uploaded every minute on YouTube, and over 4 billion videos are watched every day. According to recode, 100M hours of Facebook videos are watched every day. The question is how do you get your videos seen, and what’s the best way to get started with video marketing to increase your personal brand visibility? It’s quite common among business owners and professionals to upload a few videos on YouTube or Facebook and when they don’t get many comments or likes, they give up, believing that video marketing doesn’t work. The truth is that they don’t have a winning video marketing strategy. In this post, we reveal how to develop a video marketing strategy which will eliminate the guesswork and uncertainty involved in using videos to gain visibility and be seen as an authority in your niche. Before creating your videos, determine exactly who your target audience is and what purpose your video is meant to serve. A good starting point is to take a look at the videos of celebrities in your area of specialisation. Most importantly, even if the content helps you position yourself as an authority, you must create content that is of value to your audience. Always keep in mind why they would want to watch your video and what do they get out of it? Let’s face it. Budgets are tight and everyone wants to get the most value for the least investment. Fortunately, you don’t need the budgets of large organisations, fit out a studio, or recruit a dedicated team of video specialists. Ideally, you will need to create sufficient videos which appeal to prospects and customers at different stages of their customer journey and schedule a new video every few days or weeks. With your objectives clear and your scripts written out, you can hire a professional video marketing service agency for a few days to shoot and edit your videos. This way you don’t have to buy an expensive video camera or set up a studio with the right lighting and other equipment needed for creating professional quality videos. A common mistake business owners and professionals make is trying to cram too much into a single video. Make sure that every video that you produce has one clear message. People have limited attention spans, and will exit your video at the slightest hint of confusion, overwhelm or boredom. For example, you may have seen a typical corporate video which pans across the company head office, shows photos of the products, awards they have won and has a few words from the CEO. It doesn’t tell you much and fails to evoke an emotional response in those who watch the video. When creating a script for your video, ensure there’s a clear message that will resonate with your audience. For instance, a business coach could address the subject of procrastination: Why is this a problem and what are the three steps you can take to overcome it? A short five-minute video can easily cover this topic and provide specific takeaways your audience can implement. This is what positions you as the expert and gives you a competitive edge. It’s now time to begin producing your videos. 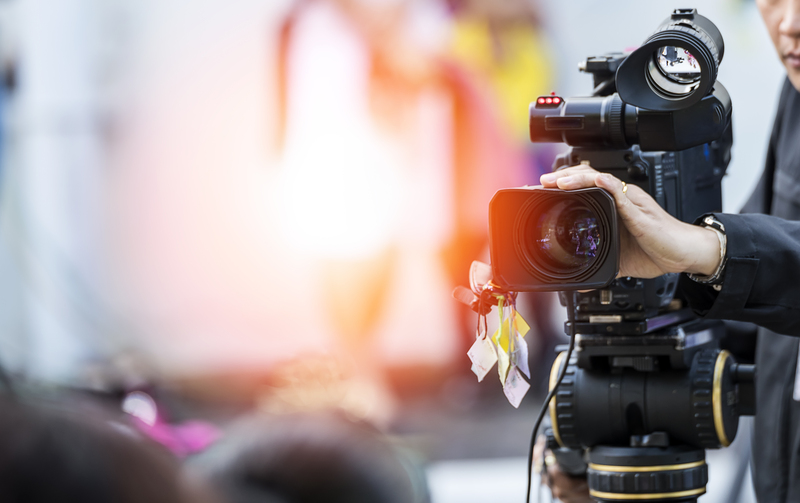 Using just one type of video becomes monotonous and your audience can quickly get bored. It’s important to use different types of videos to keep them engaged. Intro Videos: People do business with those whom they know, like and trust. These type of videos are great icebreakers, where you can quickly introduce yourself, tell your story and present a strong reason why your viewers should listen to you. Content Videos: Every one of us has their own preference for consuming content. Some like to read and others like to listen and now more people prefer to watch videos. Video combines the power of visual and auditory senses. Using the right tonality, content can be delivered a lot more effectively and in less time than it takes to read text on a web page. If you already have several blog posts, you can easily repurpose these into content videos and spread your reach to a wider audience who prefer watching videos over reading text. Explainer Videos: These type of videos are normally slide shows or animated videos which explain step-by-step how to solve a problem or perform a task. Aside from showing your target audience how to overcome a problem they are facing, by demonstrating your expertise, you gain credibility and a loyal fan base. 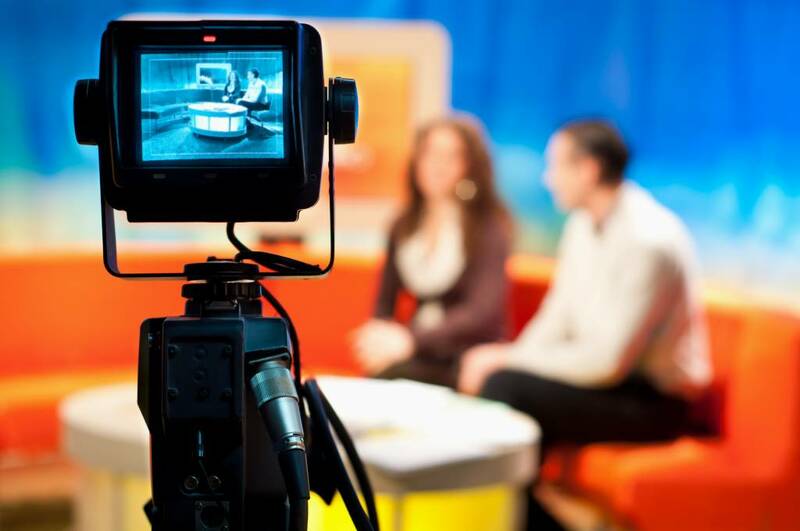 Video Interviews: Have you ever been interviewed by an expert or celebrity? Celebrity endorsement can shave years off building your credibility as an expert in your niche. Earlier the only way to gain some prominence in this way was by being interviewed on television or on radio. If you can find a well-known celebrity, even someone in your local area who is willing to interview you, record the interview and share it on social media or on your website to gain instant visibility and credibility. Encourage the celebrity who interviewed you to email the video link to his or her contacts. This tactic will help you reach a wider audience you otherwise will have no access to. Testimonial Videos and Case Studies: Many experts now use testimonials on their websites to demonstrate proof, however people often question their authenticity. Video testimonials provide a high level of authenticity, and can be used to demonstrate results of your programs or services. For instance, a testimonial video on how a coaching or other program helped transform lives of individuals and business owners is a powerful proof element. The more specific the benefit, the more effective the testimonial. It’s also important to focus on a different benefit in each of the video testimonials. For example one of the testimonials for a weight loss product could focus on the number of kilos lost, another could focus on the increase in confidence as a result of weight loss, and a third could talk about improved relationships. Facebook and YouTube Advertising Videos: If you are advertising on Facebook or YouTube, right now video ads allow you to reach your target audience at a very low cost. While this could change in the near future, it’s best to make use of the opportunity while it’s available. Research from visiblemeasures, suggests that 20% of viewers abandon watching a video in the first 10 seconds if it does not grab their attention. Research also suggests that the longer a video, the less likely it will be consumed fully. Keep videos, short and sharp, generally between two to five minutes. This will give your target audience a single takeaway they can implement immediately and also leave them craving for more. Every video which you produce should have a call-to-action, so your audience knows exactly what to do once they’ve watched your video. The call-to-action you decide on will depend on the objective you wish to achieve. For example, your call-to-action could be to “Call Us for a free quote”, “Download our Free Whitepaper to learn more” or even “Join our Facebook Group”. Once your video is produced and published, you need to optimise it to maximise its reach. If you are using YouTube to showcase your videos, find out the right keywords and tags to optimise each video. Use the keywords in the title and description, so your audience finds them easily when they perform a search in YouTube’s search console. The only way to measure whether your videos are effective is to measure the level of engagement the intended audience has with them. You will need to collect data on how the videos are being watched (desktop or smartphones), whether they are being watched until the end, where most people drop off watching and the number of repeats. If you can track down individuals who have watched a sales video until the very end but did not take action, your sales team could then follow them up with a call to try and close them, instead of wasting time calling a lead who only watched the first 10 seconds of the video. As you can see a successful video marketing strategy requires a lot of thought, but by trying different video formats, choosing the right channels, optimising the videos and measuring their performance you can quickly increase your visibility and be seen as an expert in your area of specialisation. If you’re looking for help and guidance in leveraging the power of video to position yourself as an industry expert so your prospects chase you, instead of the other way around, contact us on [email protected] to explore the best way to get started. One of the biggest challenges business owners and professionals face is how to position themselves as an authority among their ideal prospects so their products and services attract customers instead of being perceived as pushy salespersons. With rapidly increasing competition across most business sectors, the challenge is to stand out among everyone who markets themselves as experts. Nowadays, it’s not enough to just be the best. Many business owners and professionals believe that if they have great products or have mastery in their skills, there will be a demand for what they offer. The real truth is that if you don’t promote yourself, you will be lost among a crowd of others who may be as good as you are. The key here is to promote yourself in a way that is authoritative, without appearing aggressive. Many of today’s business owners and professionals have realised that it’s no longer enough to rely on their website or blogs to build their preeminence. So, how do you stand out as an authority, without appearing to be pushy or aggressive? The answer lies in the power of video marketing, which is quickly emerging as the dominant media for building strong personal brands. 63% of businesses are using video as a tool to market their products and services. Of these, 83% indicated that videos resulted in giving them a satisfactory return on investment. 82% will invest more money in video marketing during 2017. 74% of online traffic to websites will come from online video (KPCB). 65% of people watch more than ¾ of an online video (Syndacast). Using ‘video’ in the subject line of an email boosts open rates by 19% (Syndacast). Videos in a landing page can increase conversions by 80% (EyeView). Businesses using video grew their revenue 49% faster than businesses which did not (VidYard). Long-term trust based relationships, not pushy sales tactics are the key to generating sales. Nowadays people are increasingly cautious about the quality of products they buy or the trustworthiness of professionals who approach them. Videos help business owners and professionals with a vast industry knowledge present useful and interesting information in a way that ignites emotion and is far more engaging than content presented using plain text. When your YouTube videos are shared by an elite audience, they serve as ambassadors in promoting your personal brand. Updating a YouTube channel regularly can soon result in a large following which makes the need for pushy sales tactics superfluous. Once a significant follower base is built on a channel like YouTube, you can create promotional videos to present your offers or services using a conversational tone which makes prospects comfortable and gives them the confidence to buy. There are only three ingredients that are required to turn you from a relatively unknown expert in your niche to a micro-celebrity, using video marketing. Although they are simple ingredients, it takes time, effort and consistency in implementing a proven strategy. The first step is to enlighten the market about who you are and what you do. Start by telling your story, so your audience gets to know you and begins to resonate with you on a personal level. Your prospects would prefer to do business with someone they can identify with, rather than a faceless entity. What’s important to remember is not to launch into generalities about the quality of your products or the excellent service you provide. Instead, demonstrate your expertise by identifying a common problem or challenge which your target audience is facing and what they need to do to overcome it. The content should be concise, clear and easy to implement. The objective is to demonstrate your expertise and create the “Wow Factor”, which will have your audience looking up to you like a 12-year-old girl at a Justin Bieber concert. Once you’ve published a few videos, an expectation would have been set among your target audience for more. Don’t leave your target audience hanging for information, or they will move on to the next expert who feeds their hunger for content. The more often someone watches your videos online, the faster you will build the Know, Like and Trust factors with them. When you begin to post your videos regularly, you will be recognised as a Big Fish in a Small Pond. Combine this with the latest technology to place your videos in front of your ideal clients, and you will quickly start building your authority status. The final ingredient to building authority in a market is recency. How recently someone has seen your video content affects how much they trust you. One of the reasons, why someone may not buy from you is because you haven’t been seen by them recently and they’ve forgotten about you. You aren’t on top of their mind. So how do you get your ideal clients to see you recently so you stay top of mind without spending a fortune on advertising? Using available technology for platforms like Youtube, Facebook and Instagram, your videos are shown only to people who are engaged with your content, so you’re only paying to be in front of the right people at the right time. So, there you have it. If you want to stand out and get noticed, video marketing is one of the best ways of getting started. If you would like to know how to get started with video marketing, book a 20 minute no-obligation exploratory call on [email protected] and together we’ll explore the best way to get you started. Now most Business-to-Business (B2B) marketers know that there is a huge opportunity on LinkedIn right now and a lot of people are not taking advantage of it. In this piece, we’ll show you how to set the stage and do your targeting for LinkedIn ads to begin bringing in some leads. Now there are two types of advertising with LinkedIn - sponsored ads and text ads which appear in different places throughout the website. To start advertising simply look for the “Business Services” tab and click on “Advertise”. Sign in and click on “Manage Ads” and you can then start using LinkedIn to advertise your business. To begin, you’d want to click on “create campaign” located on the upper right side of the screen which brings you the 2 ads options mentioned previously. Sponsored updates resemble posts or a piece of content while text ads are just that; a few lines of text advertising your business. Choose one depending on the type of marketing that you’re doing. If you want to be recognised as an authority in your market then the sponsored updates will be more useful for you. On the other hand, if you’re trying to drive people from the text ads and onto your landing page to download a report, arrange a consultation or something of that nature then text ads might be better suited for you. We recommend testing both, depending on the type of offer you have. Fortunately, LinkedIn gives you the option to “Test Ads” simply click on the option and specify a name and language for your campaign. This is where it gets interesting; LinkedIn offers some of the best targeting options for social network advertising. You can target an audience based on location, company name, industry and job title as well as some basic demographics like age and gender. So it’s entirely possible to target people engaged in a specific profession or working for reputable companies like say, Telstra and offer them a job! Joking of course, but this gives you an idea how powerful these ads could be. As you go through the different options you’ll notice the number of the estimated audience on the right begins to drop, which isn’t necessarily a bad thing. It’s only natural as you start to narrow down your audience to come up with a targeted list of people to market your business to with higher chances of conversions. Say you want to target CEOs, founders or managers of businesses based in Australia with 50 to 10,000 or more employees; it’s certainly possible with LinkedIn ads. It’s a good idea to be as specific as possible when setting up your LinkedIn ads. Make good use of overlays which allows you to further dissect your target audience based on age. CEOs aged 35 to 55+ think differently than those who are at a much younger age and are bound to have a more stable business. Also split up your campaigns and target them based on age or gender if only to ensure that you get your ads in front of people that are at least remotely interested in what your business has to offer. Note that how specific or general you are in setting up your target audience will mean the difference between failure and success. Now we’ve all heard all about how “Content is King” and that you’ve got to put as much content out there, so that people will love you for it and give you lots of money. Well that’s not 100 percent true. First you’ve got to have your content seen and second you need to understand what kind of people love and what they don’t like. After all, you don’t want to be spending all your time creating content that people don’t actually want. This is where Google Analytics comes into play! In this piece, we’ll show you how to dissect your campaign for content that is profitable and those that aren’t worth spending more of your time creating. Let’s get right to it! The first thing that you need to do is, of course, to log onto your Google Analytics then under “Behaviour” you’d want to click on ‘site content’ then “All Pages”. This will give you data on all the existing web pages on your website. What you’re looking for are pages that you should be spending more of your time and attention on. At this point you need to have your goals set up in Google Analytics with values attributed to them. We’re not going to tackle how to do the latter in this piece but you can check out this video which should tell you more about it. Once done, you’ll start receiving data on your account and you can use it to figure out which of your pages are most valuable to you. Notice that each page has a corresponding “Page Value”. This means that users have viewed that page and have completed whatever call to action you’ve set in place. It’s a good indication of how effective that particular piece of content is. Even without an e-commerce website, Google Analytics gives you a simple way of measuring how valuable your content is. Now most people tend to focus on “page views” and while these views might be high the page value of it may not be as good (per visitor). So there’s not much point focusing on that particular metric with all your tracking setup. 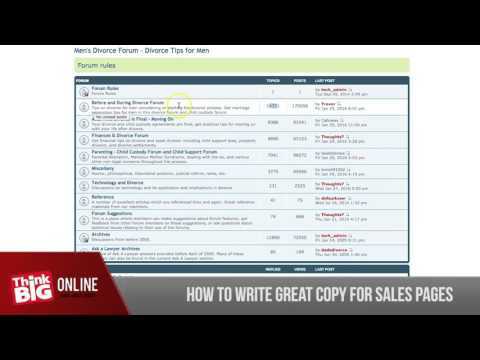 Note that in some of your pages, the unique pageviews might be low but the page value is high. Let’s say that your “contact” page has around 200 unique views with a page value of $1.67; that doesn’t sound like a lot but it’s not representative of the standard metric of goals you’ve set on Google Analytics. We are not really looking for a massive value under page value but rather the contrast between the different pages. The contact page will naturally have a high page value so you’ll need to take that into consideration when looking for the best content to optimise. Another page that you need to pay special attention to is the “About Us” or anything along that line. That page will also have a high page value and for good reasons; users check out that page to learn about the people behind the business, engage with them and hopefully move on to become clients or paying customers. It’s worth more of your time getting people to visit these kinds of pages from say a piece of blog content or other service pages. You may have other pages with high page values and Google Analytics gives you a quick and convenient way of determining where you should be devoting more of your time and effort getting more people to visit a particular web page generating more relevant traffic. You’ve got only so many hours in a day and you can’t spread your efforts too thinly trying to work on the different pages all at once. Therefore, it makes sense to focus more on pages that are bringing you the highest page value. Now if a particular web page has a high page value but low unique page views then you can work on bringing more traffic to that web page and raising the page value even higher. If you’re seeing the opposite (high page views but low page value) then it means that you have to work on getting more people to convert. Of course there are other factors that you need to consider such as the bounce rate which often directly affects page value. A high bounce rate will hurt your page value as this means that not to many people are completing the call to action that you’ve set in place. The same thing can be said about “exit rate” which measures how many people leave your website altogether through that particular web page. Lowering both would enable you to raise page value and it also gives you an idea on which of your pages you should be linking from to improve engagement and get people to stay on your website for much longer. We hope that you’ve found this article useful and at the very least, it’ll spare you from devoting much of your time and effort working on content that people simply don’t want to see. Would you like to learn more? Perhaps you’re looking to get started with some professional help in content creation, strategy or designing content then do check out http://thinkbigonline.com/; we’ll be more than happy to help! Why you should use Facebook Conversion Pixels? In this piece, we will explain to you three things: How to choose the right Conversion Pixel, how to install the Conversion Pixel and how to check if the Conversion Pixel is installed properly. Facebook gives the option to create different types of Conversion Pixels. These conversion pixels are pieces of code which you can install in specific pages of a website. For example, you have a landing page and you are collecting name, email ID and phone number of the visitors. Once someone clicks on the Submit button, they will be taken to a Thank You page. In that “Thank You” page you need to have a Facebook Conversion Code which captures leads. Each time someone reaches that page, Facebook counts that visitor as a lead. In order to make Facebook do this, all you have to do is to go to the Facebook Ads Manager, click the Tools tab on the top bar and then click Pixels in the drop down after this you will be taken to the Conversion Tracking Pixel page. Next, you will get the option to ‘Create Pixel’. You will be presented with various options of different types of Conversion Pixels like ‘checkouts’, ‘leads’, ‘registrations’, etc. Select the ‘leads’ option, give it a name and then click on the ‘Create Pixel’ button. Once this pixel is created, it will show up in the list of pixels created. You can then click on the ‘View Code’ icon next to the name of the pixel and a box will pop up which will contain the pixel code. Copy and paste this code in the page you want to track, which is the Thank You page in this case. Once the code is installed in the page, the status of the Pixel in the Ads Manager will turn into ‘Active’ and the circle icon below it will turn green. Once this is done, go back to your Facebook Ads Manager or ‘Power Editor’. Select the relevant ad set from there. You will then find in the set up an option to Optimize for a Conversion. Let’s say it is for ‘Registration for Facebook Profits Webinar’. So when we are optimizing here, we’re telling Facebook that we want our ads to be optimized and target the people who will most likely register for this event. So this becomes your conversion code. Next step is to go back to the Ad Level. After scrolling down a bit you will find a list of different types of Conversion Tracking Pixels. Here you can check confirm that you are using the conversion pixel for ‘Registration for Facebook Profits Webinar’. So this is how you set up Conversion Pixels and that’s how you set up Facebook Conversion Tracking Pixel. So there you have it - setting up Facebook conversion pixels. If you’ve found this useful then we encourage you to visit https://www.thinkbigonline.com/ to learn more!